Featuring lush fabric upholstery in your choice of easy-to-incorporate neutral hues, Sunpan’s Ariana Swivel Counter Stool is creatively crafted in classic-meets-contemporary style complete with a unique silhouette. Contoured curves and generous cushioning offer cozy comfort, while the subtle gleam of antique gold nail head, the tactile detail of distressed wood legs, and traditional meticulous button tufting add eye-catching accents in all manner of décor schemes. With its very versatile style ideal for various venues, the Ariana Swivel Counter Stool by Sunpan not only makes a sophisticated statement in the kitchen, but also can be duplicated throughout your space with Sunpan’s other Ariana seating options. Provided in multiple eye-catching colors. Distressed wood legs provide unparalleled support. Elegant contours bring a touch of glamour to any setting's décor. 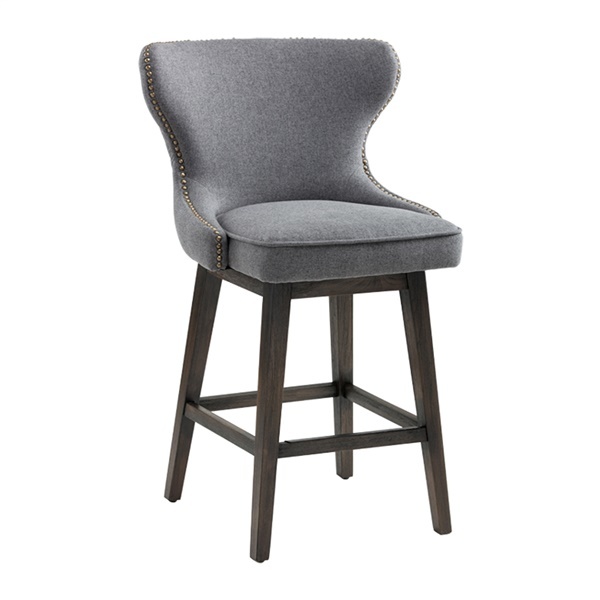 Button-tufted back with antique gold nailhead gives the chair a sophisticated appearance. Boasts a cushioned back and seat for outstanding comfort.